Last year, (the 2008 riding season), during one of my typical weekend trips, I found myself stuck in a campground, just south of La Tuque, Québec. Although I was grateful to be in this particular campground, the reason I was stuck there was an act of my own carelessness. The previous day, while passing through the beautiful city of Victoriaville, Québec, I hit a baseball sized piece of, “drainage ditch” basalt. The chunk of rock had fallen off of a truck and was lying in the road. I was motoring along, within a line of cars, and of course, following too close to the bumper of the car in front of me, and I ran over the stone, (with both wheels! ), before I had a chance to swerve around it. It wasn’t until another two hours of riding passed, that I discovered that the rear tire had suffered a, “pinched” sidewall puncture. 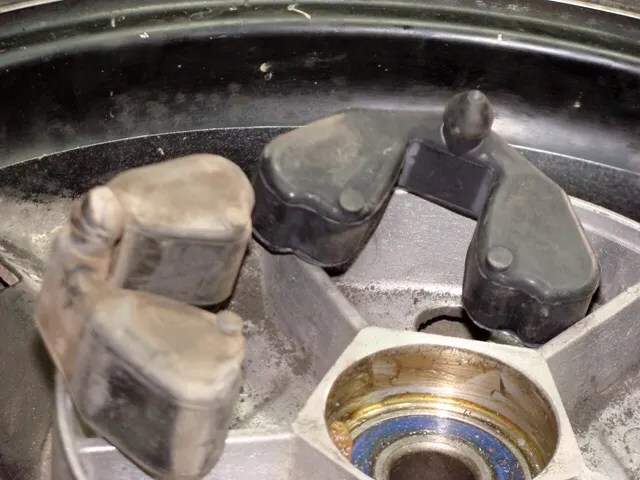 A slow leak had developed, and was increasing due to the heat build up, from the increased friction of a slowly deflating tire.. Through various methods, I was able to limp back to, Camping et Marina Mékinac. While I waited for a new rear tire to be delivered to the campground from Montréal, I spent my time listening to my French lessons on my mp3 player, writing in my journal, and checking over stuff on my bike. 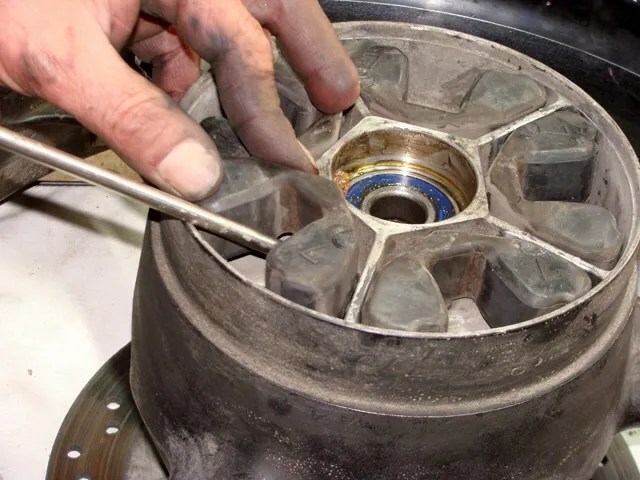 Before leaving on this particular trip, I had had a discussion with a riding friend of mine, concerning knowing when the “cush absorbers”, (located in the rear sprocket carrier. ), are worn out. 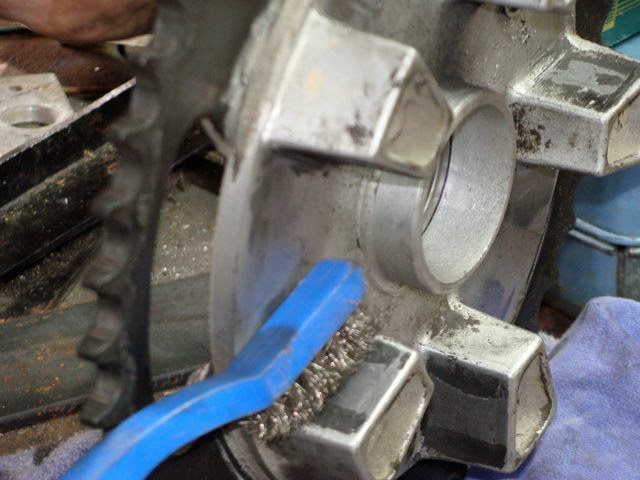 “If the sprocket carrier drops out on its own, then the absorbers are worn.”, came the reply of how to diagnose the issue. Remembering this discussion, I walked over to the rear wheel of my bike; it was leaning up against a tree. I picked it up, with the sprocket side parallel to the ground, and gave the wheel a slight jerk. The sprocket carrier fell immediately to the ground. It looked like the cush rubber absorbers in my sprocket carrier were due to be replaced! Here is a short video illustrating that test. The above video was shot onOctober 11, 2009. This is 30,000+ miles since I did the original test back in 2008 in the campground. Obviously, I wasn’t too concerned about what I discovered! Here are two schematic diagrams of what I will be referring to in this article. The absorbers, (they are made of rubber), are item #6 in the below diagram. 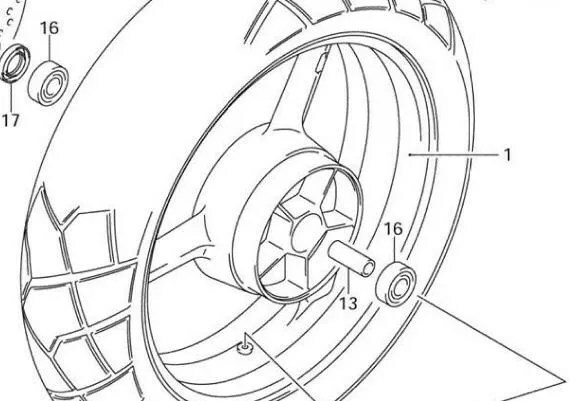 They fit into the corresponding “pockets” in the hub of the rear wheel. To do this job, I had to remove the rear wheel. 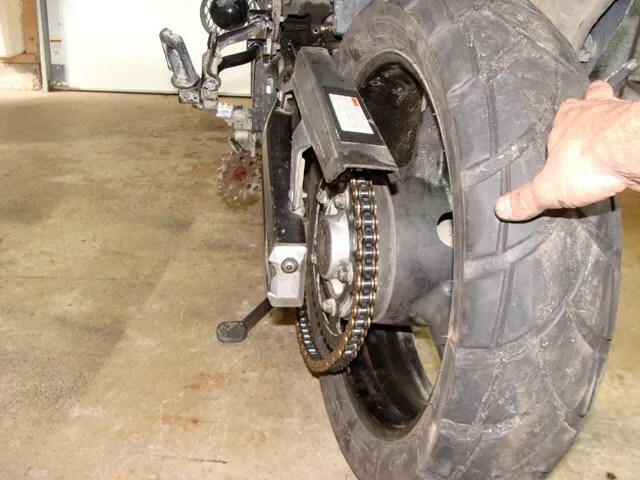 Most riders, who do their own work on their bikes, (such as replacing chains, sprockets, rear brake pads and changing rear tires), have come up with their own specific way of removing, and installing, the rear wheel of their bikes. I would like to share my own method. First, I have to get the rear wheel of the bike, up off of the ground. 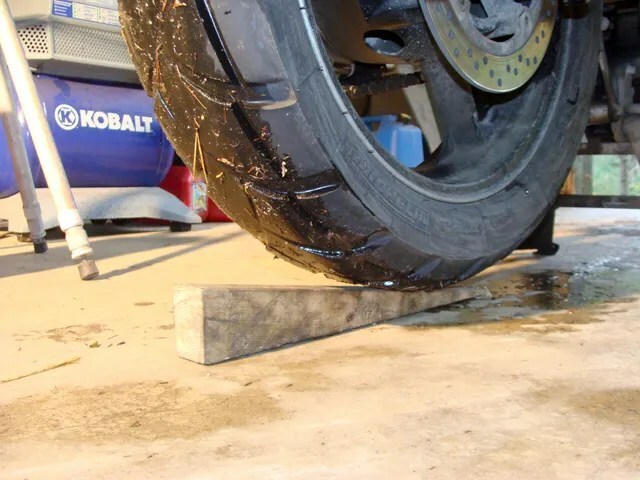 I believe that a centerstand is the first, “maintenance category”, aftermarket part that should be purchased, and installed, on an adventure style motorcycle. I rolled the bike up on to its centerstand. Then, I removed the cotterpin from the axle-bolt. 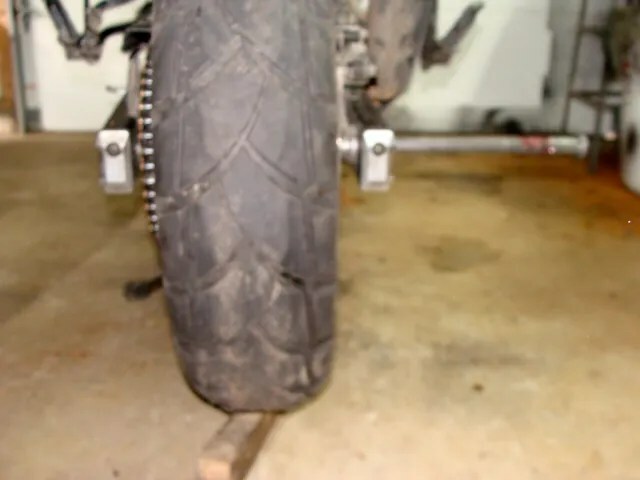 (You may notice that my axle nut is on the left side of my swingarm. This is opposite from the Suzuki OEM setup. I will explain why later.). I have replaced the OEM cotterpin with a larger stainless steel cotterpin. 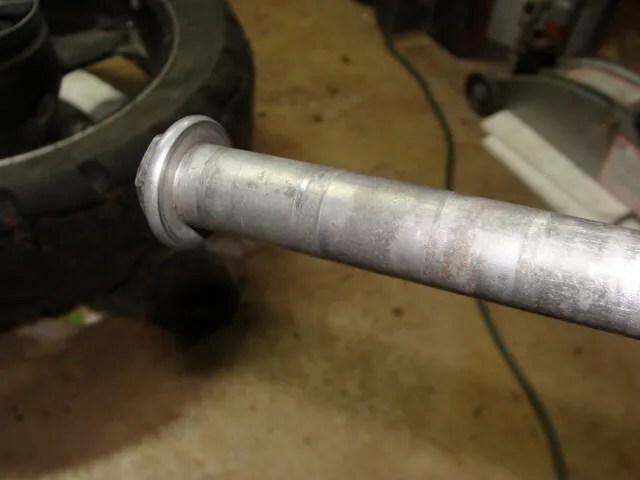 I did this so that the stainless steel metal would resist corrosion better then the OEM steel cotterpin, and also that the stainless pin is a softer metal and will resist metal fatigue, (from bending and unbending from repeated removals and installations). 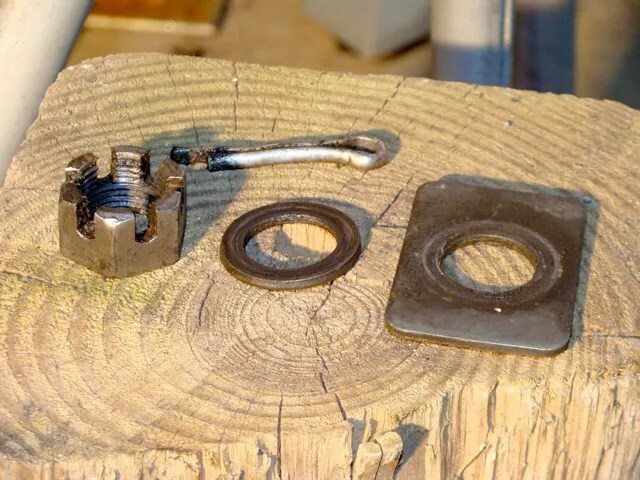 Other riders have found better solutions then the cotterpin. I just haven’t made the change yet. Here I use two screw drivers to pull the cotterpin out of the axle. Next, I loosened the rear axle. 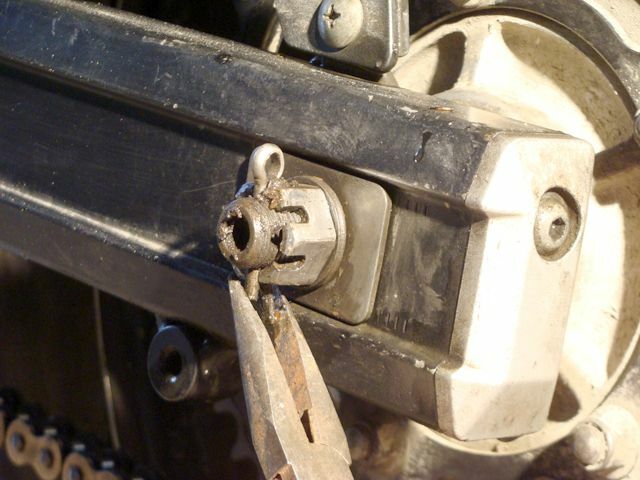 After that, I loosened the chain adjusters just a bit at either end of the swingarm. At this point, I slid a wooden wedge underneath the rear wheel; lifting the weight of the wheel off of the axle. I can now, very easily, slide the axle out of the swingarm! 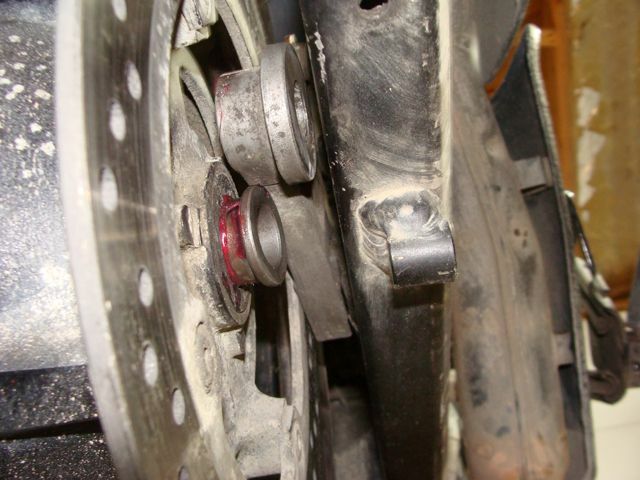 I removed the wooden wedge to let the wheel drop free of the swingarm. Usually, the axle spacers drop out when I do this. If they don’t, I reach up and wiggle them out. Now, I roll the wheel as far forward as I can, until it fetches up against the rear side of the swingarm cross-member. 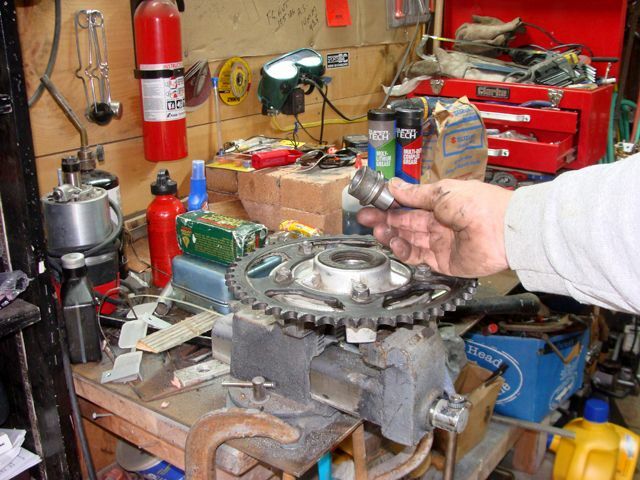 Then I remove the chain from the rear sprocket. 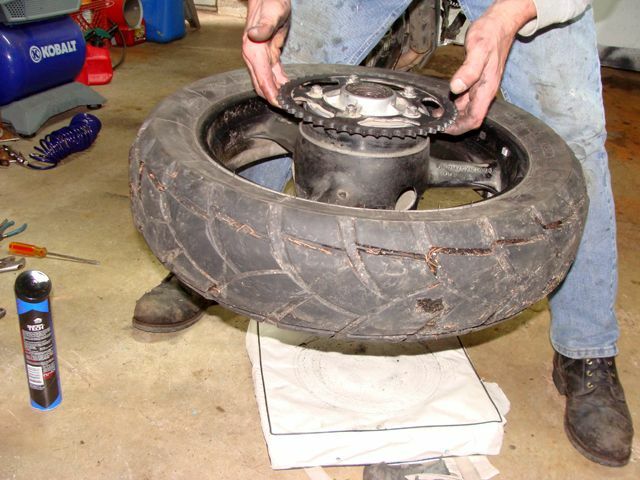 The rear wheel will now roll out from underneath my motorcycle. 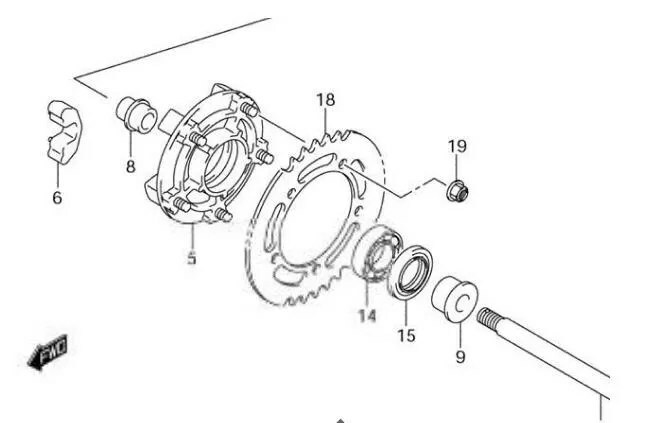 The sprocket retainer is supposed to be “free floating” on the inboard side of the sprocket carrier. Mine was frozen to the bearing due to water corrosion. I tapped it out using a hammer and screw driver; the plastic handle acting as the “punch”. I cleaned up the sprocket retainer with some Scotchbrite and set it aside for later reassembly. 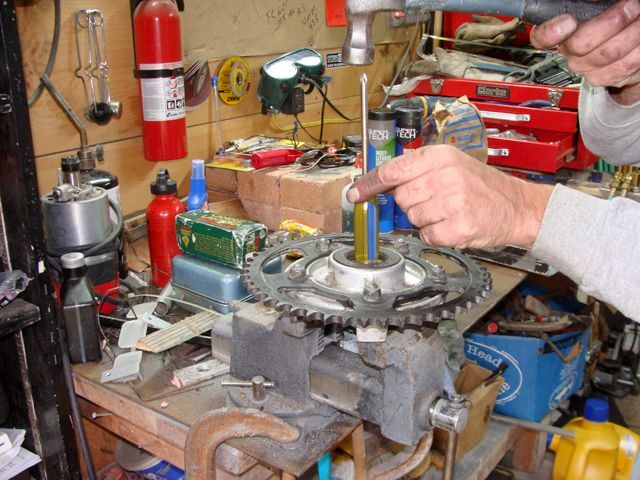 Here, I am using a small wire brush to clean the crud off of the “ears” of the sprocket carrier. Next, I removed the old absorbers with a screwdriver. 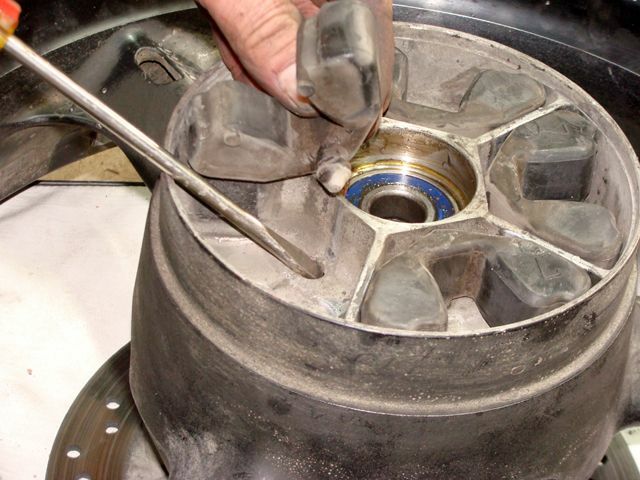 I found out that there is a “tab” that is molded into the absorber that has to be freed from the hub. I also used my wire brush to clean up the crud in the cush-housing. Here’s a photo of the original absorber next to its new replacement. They look exactly the same and I couldn’t detect any wear, (smaller size), when comparing the old absorber with the new one. 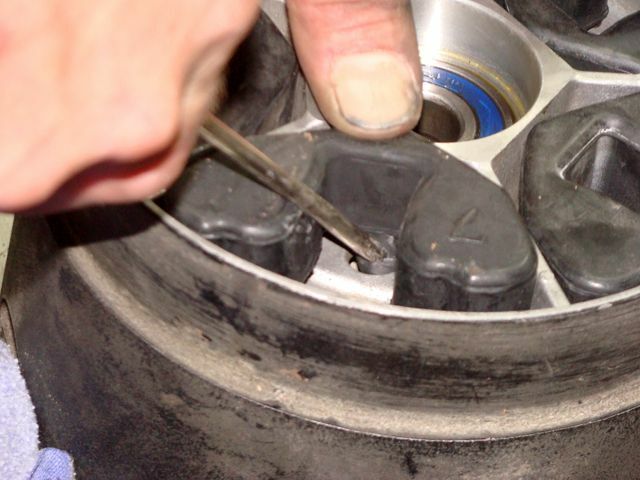 Again, I used a screwdriver to work the tab of the new absorber into its corresponding hole in the hub. 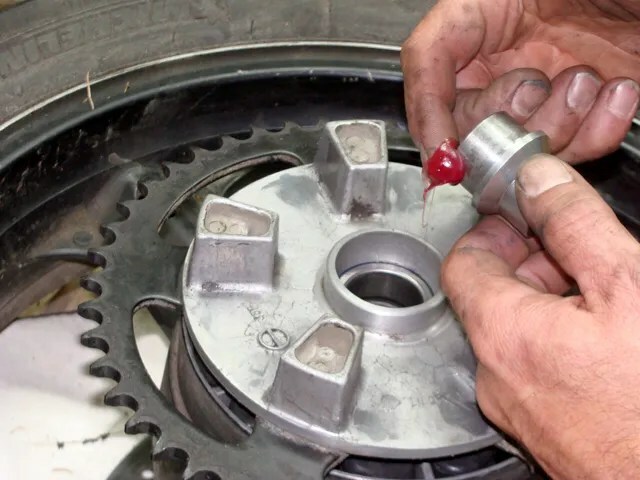 I placed some grease around the sprocket retainer and slid it back into the sprocket carrier. I placed my rear wheel, brake disc side down on top of an old boat cushion. Probably a better solution was to place my wheel assembly on top of an old rear tire. 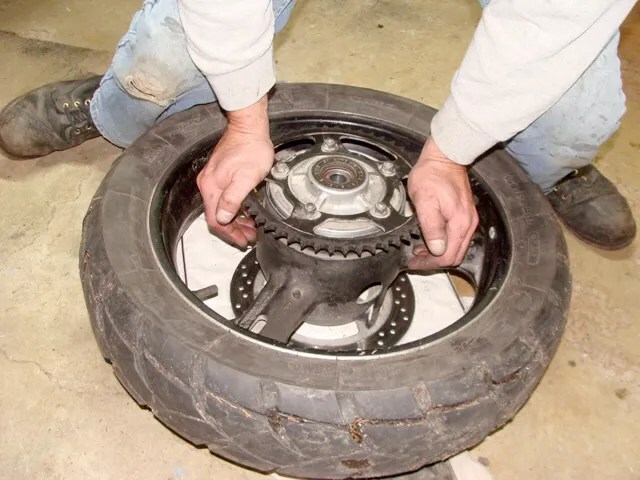 By doing this, the brake disc makes no contact with the ground and doesn’t receive any stress when installing the sprocket carrier assembly. I didn’t think of doing this at the time……. But, I didn’t have any problems either. 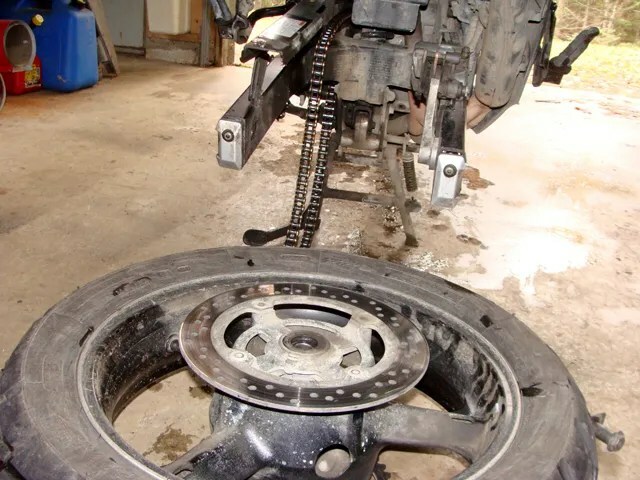 Even though the new absorbers didn’t appear to have any difference then the old absorbers, it took quite a bit of pressure to drive the sprocket carrier “home”. I was surprised enough at what effort it took to press the carrier into place, that I separated the two, just to make sure I didn’t have anything misaligned! I didn’t! I tested the assembly with a couple of good “shakes”. The wheel didn’t drop away from the sprocket carrier I was holding in my hands. 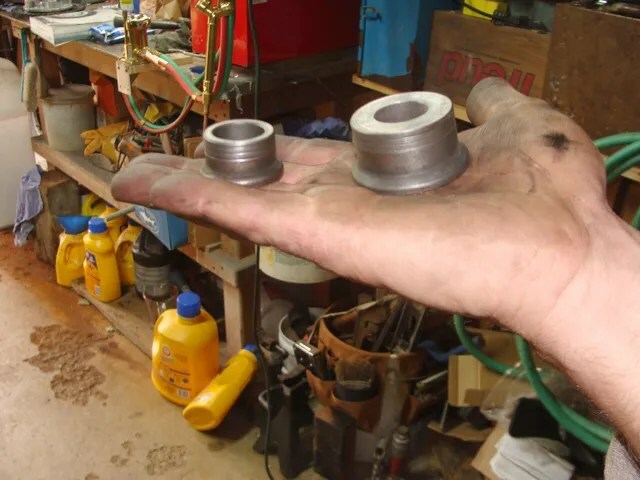 First, I examined the axle spacers and axle. I cleaned mine up with some Scotchbrite so that I could visually inspect them better. See the grooves in the spacers and axle? I need to replace mine. I will do that before the 2010 season. I gave each a light coating of grease before reassembling them. I rolled the wheel forward, until it hit the swingarm cross-member. Then, I placed the chain over the rear sprocket. I reached in, and slid the axle spacers into their “home” position. A rider can’t mix them up. They are different sizes. 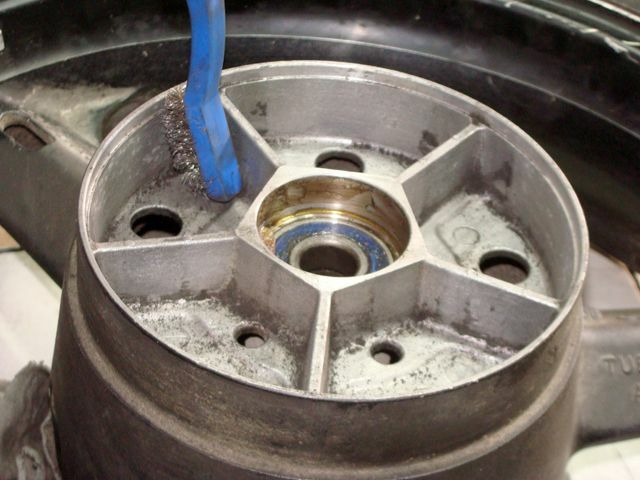 They can only be installed on the axle and against the wheel hub one way; no matter which direction you choose to install the axle. Now, the tricky stuff! I installed the rear brake caliper back on to its track. Then, I slid the axle bolt through the swingarm adjuster, and the caliper arm, to hold the brake caliper in place. This is the reason I mentioned earlier as to why I have flipped around the rear axle. 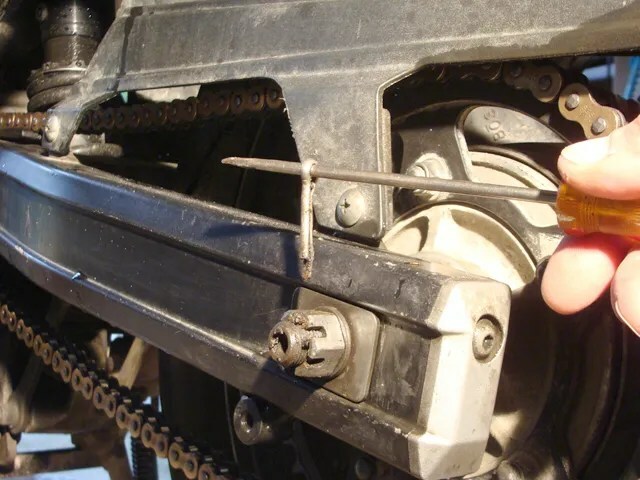 Doing this, has the axle acting as another pair of “hands”, to help hold things into place, while installing the rear wheel. From here, I placed my wooden wedge on the floor; judging about where the rear wheel needs to be when I roll it backwards, away from the swingarm cross-member. Then, I rolled the wheel backwards. I adjusted the wedge, so that the wheel gets “lifted” up, and aligned with the swingarm, chain adjusters. 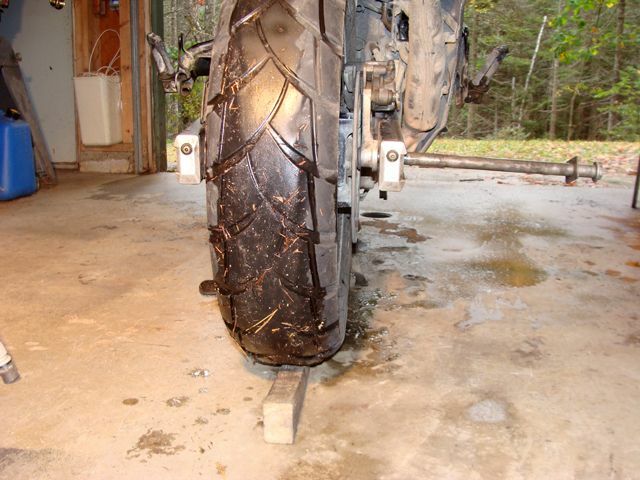 Then, I pushed the axle through the swingarm and wheel; out the other side. Next, I installed the axle plate, washer, and nut, and lightly snugged it down. I adjusted the chain to my desired tension. 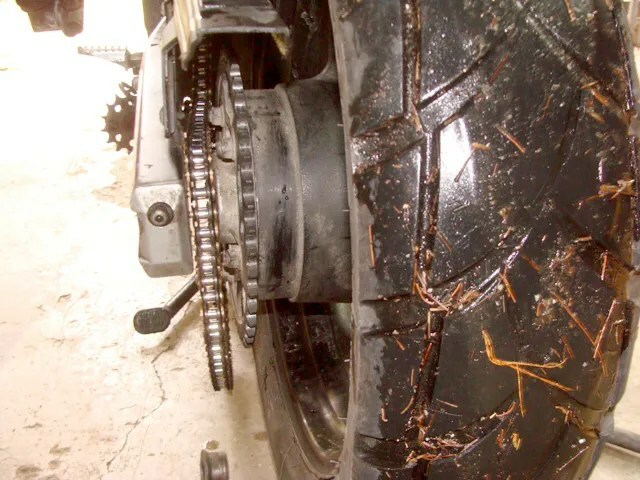 I believe that it is best to adjust a chain while the motorcycle is on its centerstand. (The Suzuki Owner’s Manual method of adjusting the chain tension, is to have the bike on its sidestand.) 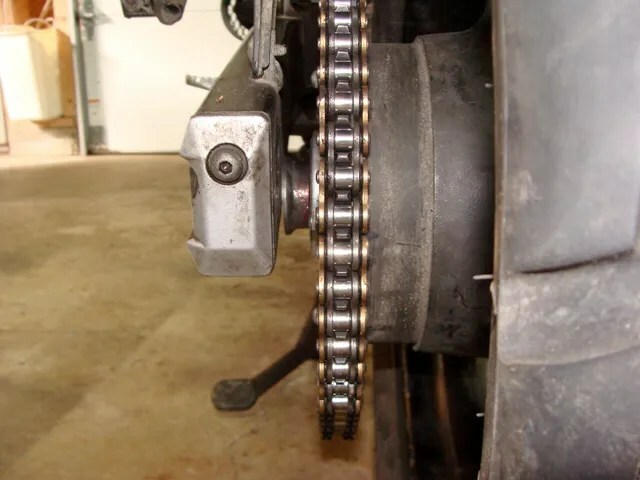 By doing this, I am free to rotate the rear wheel to determine where the “tight spot” is of the chain, (New, or old chains have “tight spots”.). 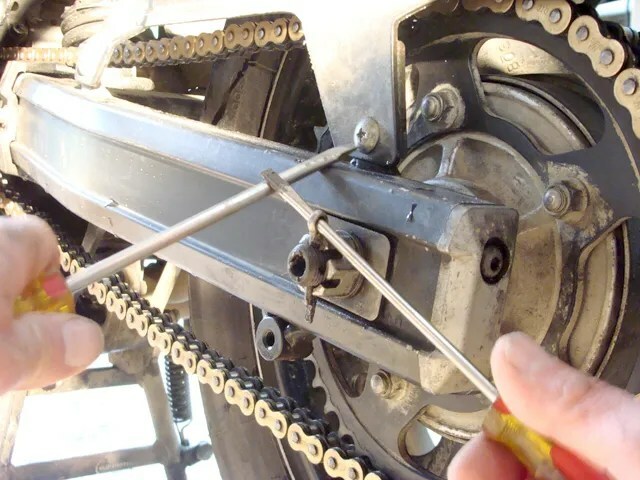 I make the chain adjustment with the chain at its tightest spot. I leave my chain looser then the Suzuki recommendation. That’s because, with the bike on its centerstand, there isn’t any weight on the swingarm; adding additional tension to the chain. I also often ride on very rough roads and I prefer a “slacker” chain for riding in these conditions. Once the chain was adjusted, and the wheel was aligned properly, I tightened down the axle nut, and added the cotterpin to finish things up. 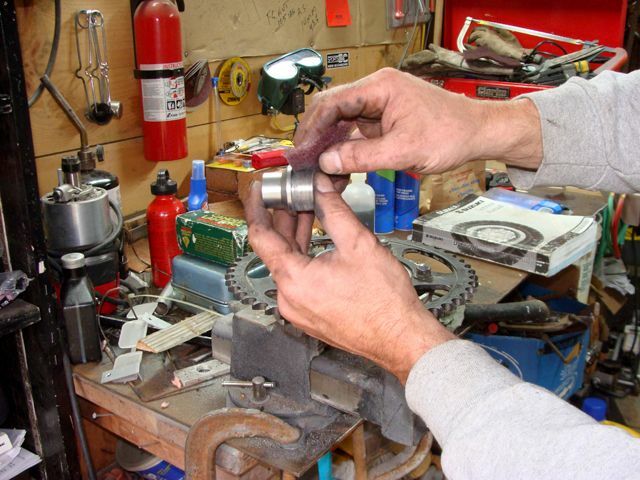 The final task was for me to “pump up” the rear brake peddle. I learned the hard way by NOT doing this once! 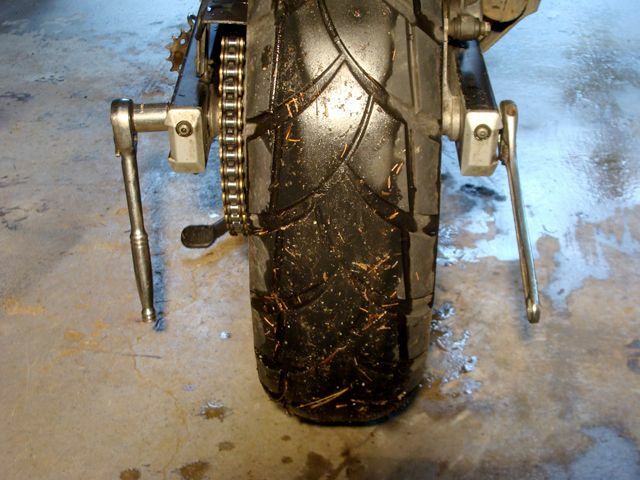 When I went for a test ride, and came to a stop sign, as I began to apply the rear brake, there wasn’t any! I had forgotten to “pump up” the rear brake system after removing the rear brake caliper. Boy, did my heart leap into my throat! What kind of Rims are those? 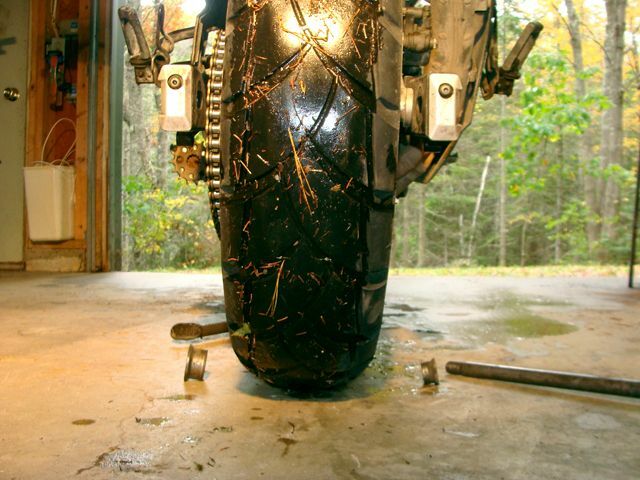 That is a Klr 650 your working on right? No, it is a 2007 Suzuki DL-650 Vstrom. I rode that from 2007 to 2012 when I gave it away…. (With 111,000 miles on it! All mine too!). I started riding the KLR in 2013, after completely rebuilding absolutely everything on the motorcycle. Then, I rode it across Eastern Quebec, Labrador, Newfoundland, across Cape Breton and Nova Scotia; back to my home in Maine. I sold that bike in 2016. I don’t own a motorcycle, nor have I ridden one since then. I am involved in too many other things right now! Can i know how many kilometers had your dl-650 before change the cushions? About your experience, was it really necessary to replace them? Did you notice any improvements later? Many tnx for a your response. Regards. Hello, a few of your questions are too hard for me to answer. The reason being is, this all took place nine years ago! A rough guess as to mileage is, I bought the motorcycle brand new in the spring of 2007. By the end of the season, I had ridden 23,000 miles. I rode 21,000 miles in 2008. I am guessing that, I was at 60,000+ miles when I changed out the Cush Drive. As to wear, mileage does have something to do with it, but so does how aggressively a person rides. I would consider myself an aggressive rider, so the Cush Drive is going to wear down faster. Do the test that I show in my video. If the hub drops out of the wheel, replace the Cush Drive. You WILL notice a difference! The bike will feel “tighter”.